FileMorph 2.41 is released. | Print2Email – Version 9.1 is released. Print2Email – Version 9.1 is released. 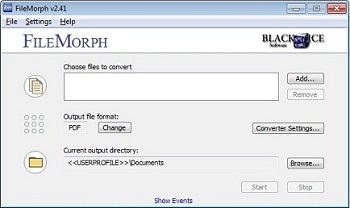 Black Ice Software has released FileMorph version 2.41. FileMorph Version 2.41 includes updated printer drivers and numerous problem fixes. Print2Email release 9.1 includes a patch for printing web pages from Microsoft IE9, Printing PDF files by clicking on the PDF file with the right mouse botton. This release also includes improved use of the MAPI client. In Previous versions the email attachment name does not match the document name. Print2Email version 9.1 also includes an updated Printer Driver – contains the RAW printing (1kb PDF when Enable advanced printing is unchecked).